Every human being is called by God to abide in his love: to be holy by conforming the heart and mind to the will of God, and in particular to be conformed to Christ in his Church through baptism. The Christian is called to love God and neighbour, and to make God’s presence known in the world. Every Christian shares this Divine calling or “vocation”. Marriage is a partnership where a man and a woman give themselves to each other for the whole of their lives, bearing witness in their union to Christ’s love for the Church and the world. God willing, their love for each other overflows into the gift of new life in children, whom they bring up as loving members of the human and Christian community. For more information about preparing for and celebrating marriage at St Cuthbert’s, see our page on Marriage. Consecrated Life involves the profession of Poverty, Chaste Celibacy and Obedience whether lived in a community (e.g. as a monk, nun, friar or sister) or singly in the world. See www.ukreligiouslife.org for more details. Single lay life is what we are all born into; but some make this their positive choice, to give themselves to Christ while living in the world as his witness. Priesthood is a life consecrated to the service of God’s people proclaiming God’s word, sanctifying his people, and caring for his flock. Some members of religious institutes (such as the Dominican Friars) are ordained to the priesthood; but most priests are ordained for ministry in a particular diocese. For more information about vocation to the priesthood, see www.ukpriest.org. Deacons are single or married men ordained to assist the bishop and the priests in the service of the people. If you would like to talk about how Christ might be calling you to follow him in your life, do get in touch with the Parish Priest, who will be very happy to meet with you. 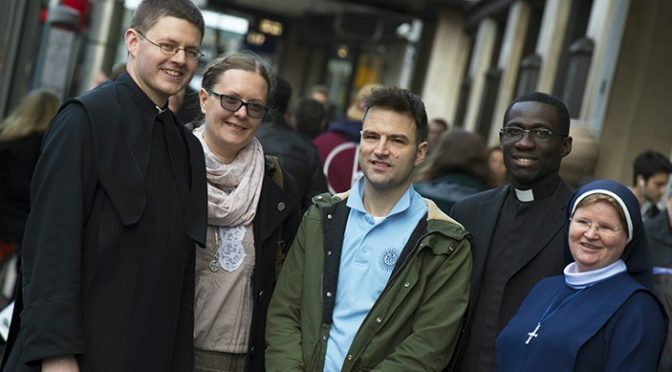 General information about vocation and discerning your call can also be found at www.ukvocation.org.